When was the last time you read a book or saw a film that had no physical setting? That is, was not placed in a location you as reader or viewer recognized as at least a possibility? I’m currently watching a rerun of Star Trek Voyager. The characters are familiar. The dress and language are recognizable. The location is … somewhere in the Alpha Quadrant. Who knows where or what that is? Fans of the Star Trek franchise are familiar with these vast stretches of the imagination. We expect it, embrace it and depend upon it. It’s Science Fiction, after all. Fantasy at its finest. But what about other genre fiction: Mystery, Crime fiction, Westerns, Contemporary, Regency Romance? In these fictional worlds, we’re not that comfortable with entirely imaginary places. We like to know that the London of the 19th Century has the accoutrements we know from history and the novels of Eliot, Thackeray, Austen and Dickens. And that the Alamo is as dusty and dry as we’ve been led to expect from legend and Hollywood film. Why are we less willing to suspend our disbelief when we read these genres? Why do we depend upon these anchors in reality when we are well aware that we entering a fictional world? In my novel, Wait a Lonely Lifetime, the first part of the story is set in Florence, the second in San Francisco. I first visited this northern Italian city in the Fall. The city was not overwhelmed by tourists at the time of year, nor was the weather too fierce. The story itself could have taken place in any city or town anywhere in the world but I had visited and fallen in love with Florence. 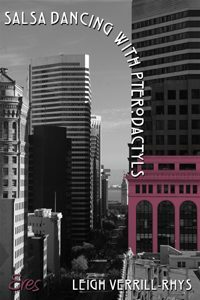 Although, at the time of my visit I was working on another novel, Salsa Dancing with Pterodactyls, set entirely in San Francisco (with the occasional pop over to the Central Valley and Marin County), the story set in Florence swept me off into that world of piazzas, Mentana freedom fighters, Mafia atrocities and Cosimo Medici. None of these details were essential to the actual story I wanted to tell about Sylviana and Eric, but they all added physical depth, flavor and a sense of place. When the time came to return to writing Salsa Dancing with Pterodactyls, I had used many of the landmarks and features that are remarkably San Franciscan in Wait a Lonely Lifetime: boating on the Bay, steep hills, narrow alleys, those that best reflected the daily lives of a woman, recently divorced and raising two young girls. For the love story Emily and David in Salsa, I chose commuter trains, office buildings, dance venues, Victorian houses and restaurants, the Golden Gate Bridge and redwood-lined highways. These physical attributes of a place lend authenticity and grounding where Sci-Fi and Fantasy rely on the lack thereof to create a sense of displacement and wonder. From Chapter 2: That evening, Emily, just another available female in a city already jammed to the shorelines with unattached women, wrote the date for the summer performance in her diary with no certain commitment that she would dance. Site Development & Design by Camfa.